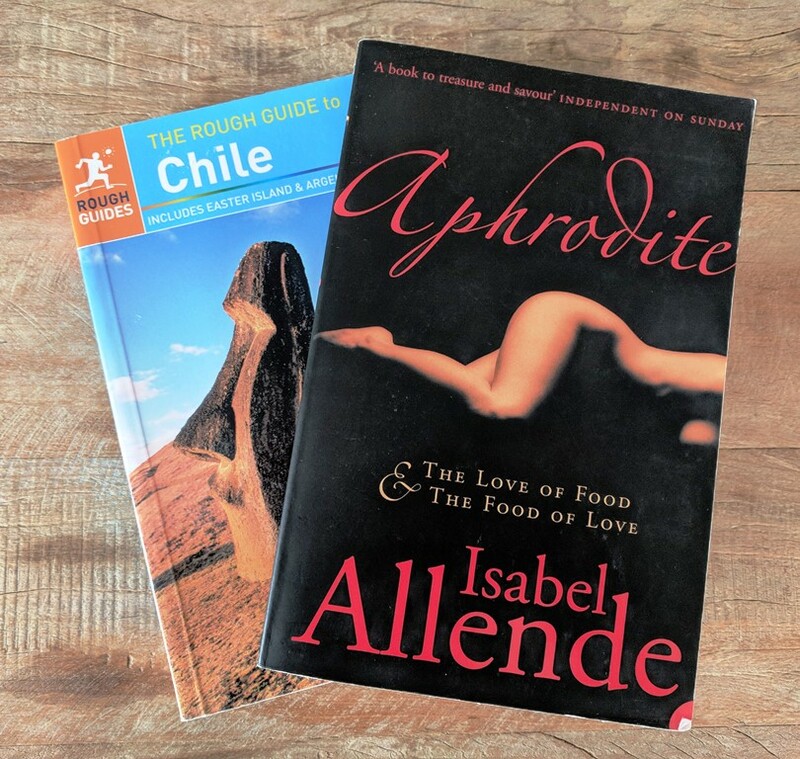 I’ve been more than a little obsessed with Chile ever since I read Isabel Allende’s Aphrodite well over a decade ago. In it, she describes the Bacchanalian experience of the curanto: a ritual that starts mid-morning with the heating of stones and the digging of an enormous hole in the ground, and continues with the layering up of nature’s bounty from earth, air and sea: vegetables, meat, poultry and fish, all covered with a layer of banana leaves. At sunset, the curanto is unveiled in a puff of fragrant steam and everyone gathers round to share this aphrodisiac stew. Alas, when I reached the town known for its curanto (it only happens once or twice and week and we were only there for two days for this precise purpose) there was an Ironman competition in full swing and the curanto was cancelled. I was devastated, and Chile had much to do to make it up to me. I had (and generally have) high expectations, which means disappointment is often swift and severe. 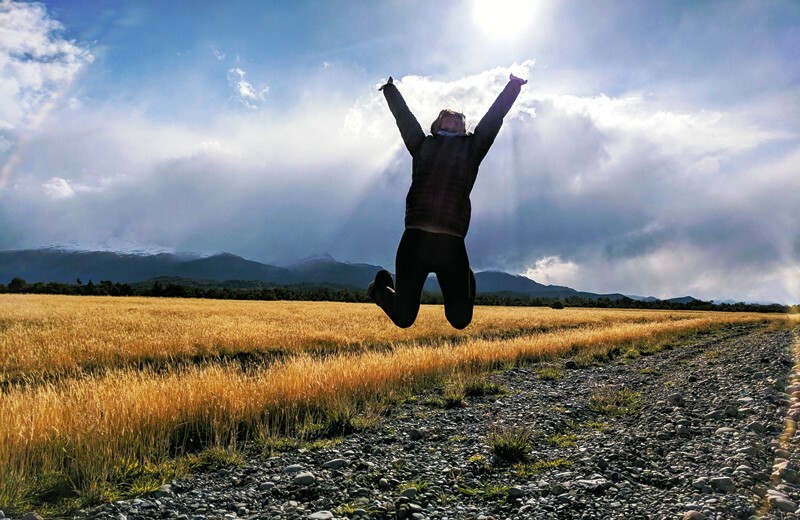 But it’s testament to Chile’s fresh-from-the-earth ingredients, staggeringly diverse landscapes, big-hearted wines and even bigger-hearted people that I came away feeling even more in love with the country having got to know it than I did when Chile was just a teenage crush. 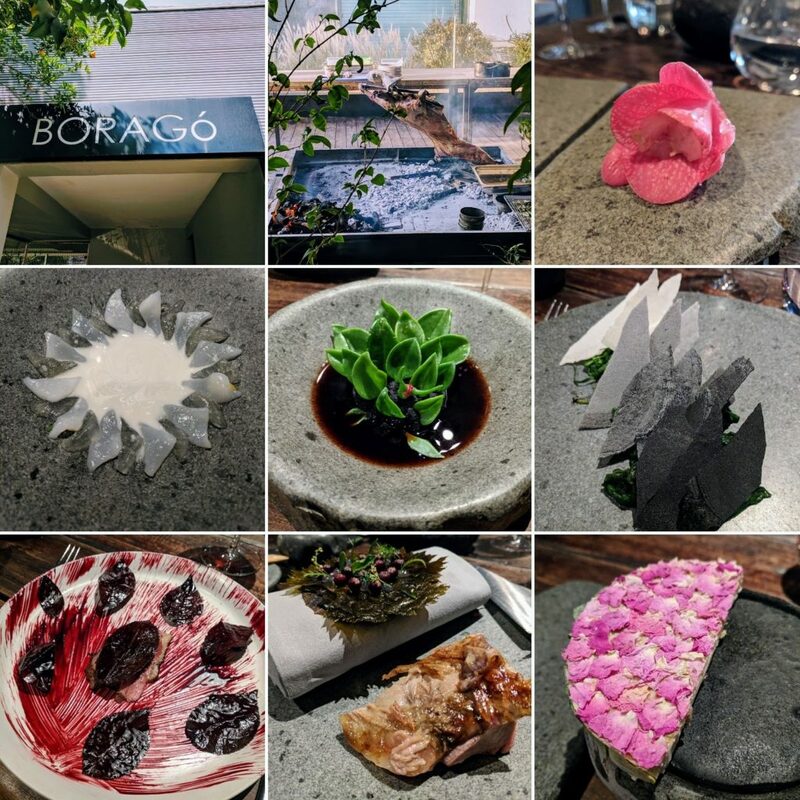 As a foodie in Santiago, you should seriously consider splashing some cash at Boragó: widely agreed to be Chile’s top restaurant, and ranked #42 on the World’s 50 Best list. I’m not much of a one for fine dining in general – I’ve had enough foie gras and foam to last me a lifetime – but places like Noma, Hiša Franko and Boragó are different in that they’re absolutely representative of the locality in which they exist. You will taste things you’ve never tasted before and probably never will again – ingredients that have been foraged from the salt flats of the Atacama Desert to the forests of Patagonia. You might not like all of them, but that’s not why you’re here. In the middle row on the left, you can see jibia (a giant variety of squid) and aloe vera in an almond milk sauce – delicate and silky. In the very centre is a so-called “rock salad” that hides sea urchin – a very… female taste. It wasn’t for me but the boys wolfed it down – I rest my case. Centre right, the rock theme continues: god knows what the slate sheets were made of, but they separated spinach, samphire, sea aster and other greens that got progressively more smoky and citrusy as you worked your way from dark to light. In the bottom row, the red plum leaves hide smoky fruity duck, painted with umami-rich miso: one of my favourites. And finally Boragó’s signature dish: Patagonian lamb, literally crucified and slowly roasted over hot coals (see centre images, top and bottom). It came with crispy apple leaves and zesty red berries that reminded me of sumac but undoubtedly weren’t. Oh, and the water on the table is collected from the rainforest. Mental. In the upscale Las Condes district, you’ll find a host of gourmet restaurants – including the Santiago edition of Peruvian chain La Mar. Now, I rarely go to international restaurant chains (and even more rarely write about them), but I make an exception for La Mar’s sublime ceviche. 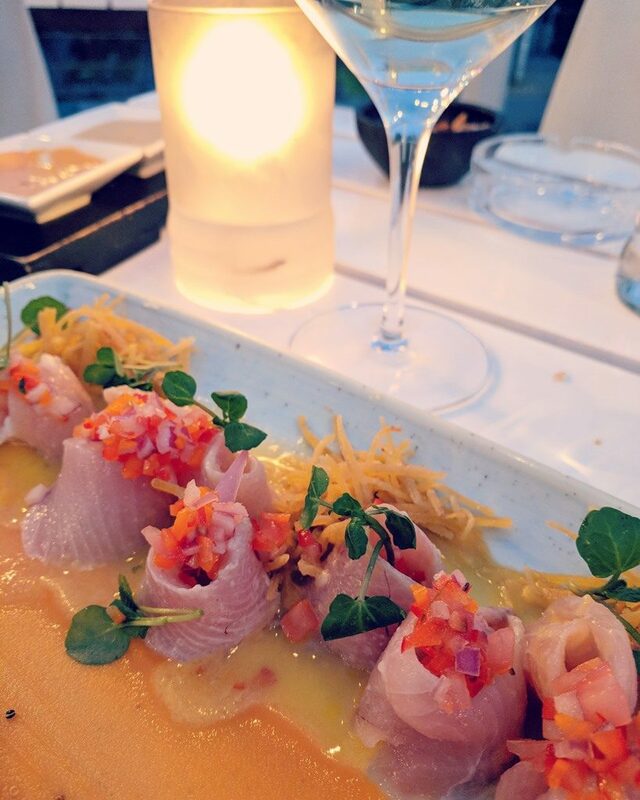 We tried the “Tiradito Sunset”, which looked as pretty as it sounded: a firm, pink-fleshed fish with sweet potato, citrusy leche de tigre and spicy aji (my new favourite chilli). That was just a starter but it was easily enough to share. Next, we shared the “Piqueo Nikei”, which comprised four small dishes from sashimi to ceviche – all impeccably fresh and competing for my favourite dish of the night. The bottle of Chilean Chardonnay we drank was equally delicious, but it might have had something to do with the sunset views we were enjoying from La Mar’s rooftop terrace. Hands-down one of my favourite meals of the entire trip. In a completely different environment but no less delicious is Tanta, found in (wait for it) the Costanera shopping mall. Yes, it might sound unlikely but the locals swear by this place, and now so do I. 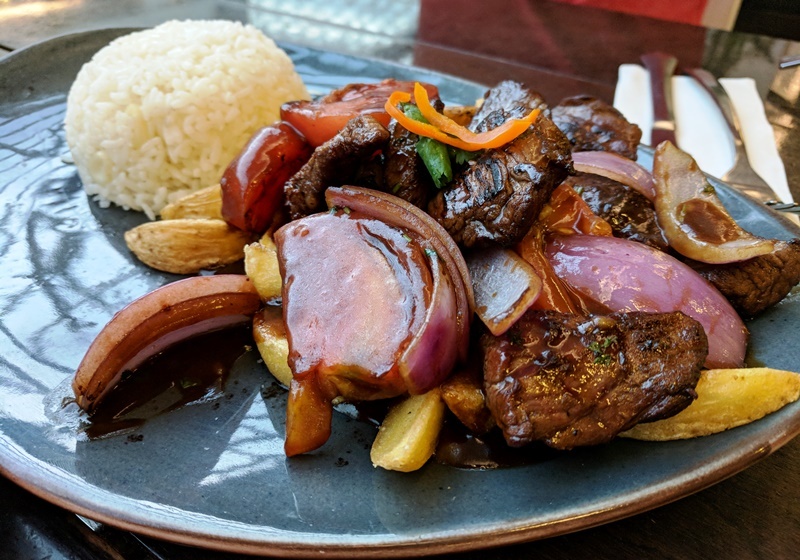 Try the lomo saltado: a Peruvian dish of stir-fried sliced beef, tomatoes and peppers, served with rice (our friend loved it so much he went back three times in one week!). Alternatively, if you can’t get enough of the Chilean fish, Tanta’s ceviche is top-notch too and the portions are huge. 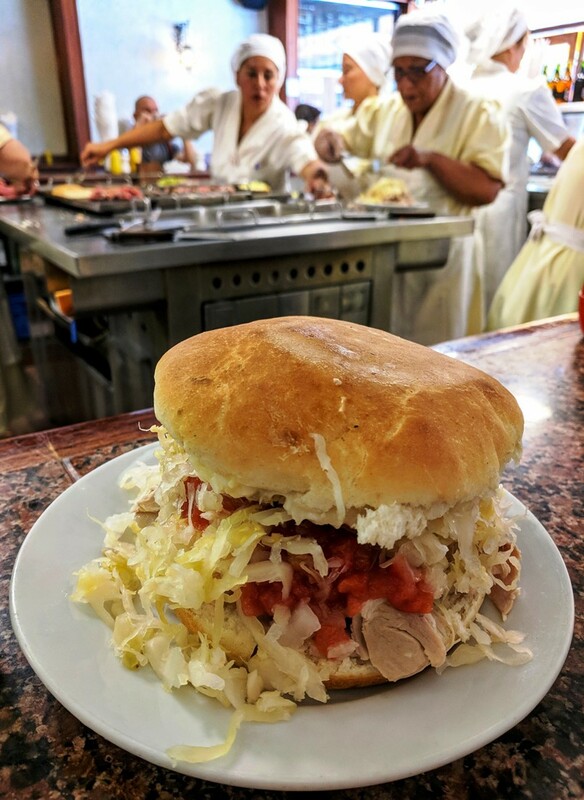 All over the city you’ll see sangucherías serving piled-high sandwiches that look big enough to feed the Chilean army. I only tried one, but it came highly recommended as an absolute classic: Fuente Alemana. It’s right in the centre of town, which makes it handy for a mid-sightseeing lunchbreak. There’s a strange ticketing system, and no one speaks any English, but you’ll figure it out with a bit of pointing and guesswork. I tried the lomito completo, which is essentially sliced pork cooked in broth, piled up with mild sauerkraut, tomato salsa and mayonnaise. Add hot sauce and eat with a knife and fork (and preferably a friend) – this is one sandwich that’s not going to fit in your mouth or your belly. 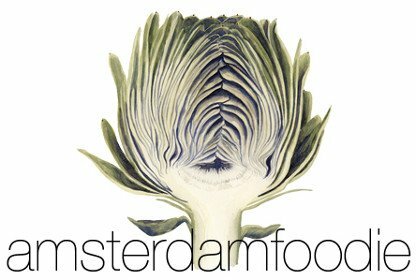 Traditional Chilean food was not too easy to come by in Santiago (a bit like traditional Dutch food in Amsterdam – it’s there but you have to look for it). One place I did find an excellent example of it, though, was Liguria – a buzzing spot for lunch or dinner with three central locations. I tried the pastel de choclo, which is probably best described as a meat pie but with a topping of maize instead of pastry or potato. Think stewed beef, chicken legs, eggs, plenty of thickly rich sauce – all topped with a sort of sweetcorn mash. It sounds odd but it tastes great, especially when paired with a crisp salad and an even crisper white wine. Liguria’s restaurant on Avenida Providencia is possibly the most atmospheric, decorated with colourful murals and old-school portraits and posters. Perched at the top of the well-kempt Bicentenario park, Mestizo is a stunning spot for a sundowner while gazing over the green lawns, fern-fronded ponds and tropical palm trees. And the food isn’t half bad either. 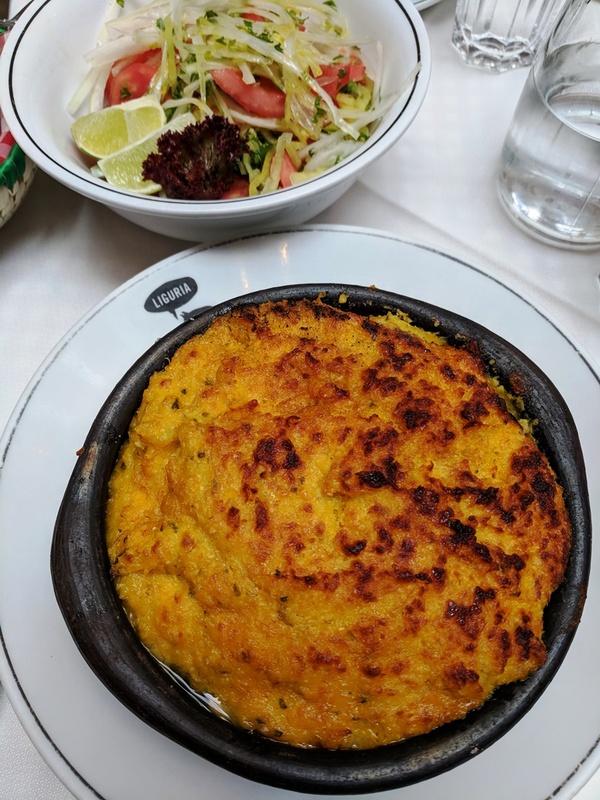 I ordered the salmon and shrimp ceviche (again – I was a bit obsessed), while Mr Foodie tried a seared tuna steak with pistachio and parsley mash. Both were expertly executed, and felt as classy as the location. A great spot to impress a date. While wandering through the bohemian boutiques in Barrio Italia, we stumbled across an inner courtyard that was cool and quiet – the perfect respite from the midday heat and pollution. 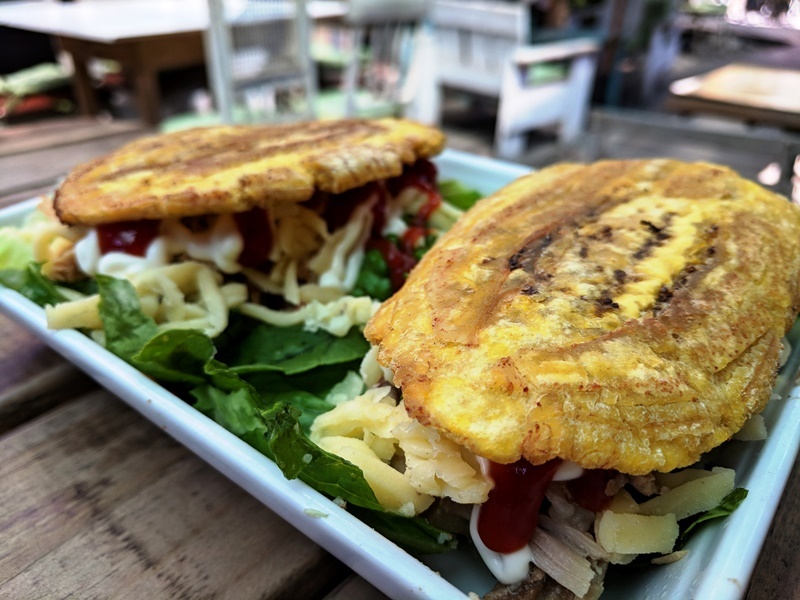 Avila Gourmet serves a fusion of Chilean and Venezuelan food, and we particularly enjoyed the arepa pabellón: think pita made from maize dough stuffed with pulled beef, black beans and white cheese. Equally delicious was the patacón sandwich, in which the “bread” was made from flattened slices of plantain, filled with various meat (we tried the chicken and pork), lettuce, tomato, cheese and mayo. 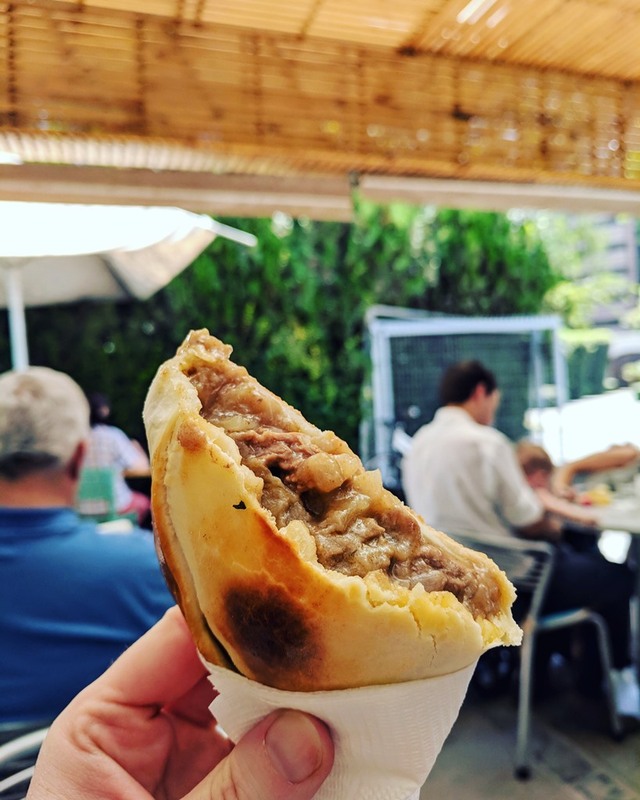 You’ll find empanadas all over Chile and Argentina (and presumably further afield too), so we picked one up pretty much whenever we felt peckish and in need of a snack. I’ve got it on good authority that the best in the city (indeed, in the world!) is to be found at Cafetería Lyael, but it was closed for vacation the week I was in town (gutted). I did, however, enjoy the camarón queso (shrimp and cheese) empanada at La Punta very much indeed. And, given how busy the bakery and café seemed to be the lunchtime I was there, I can only assume the rest of the clientele agrees with me. 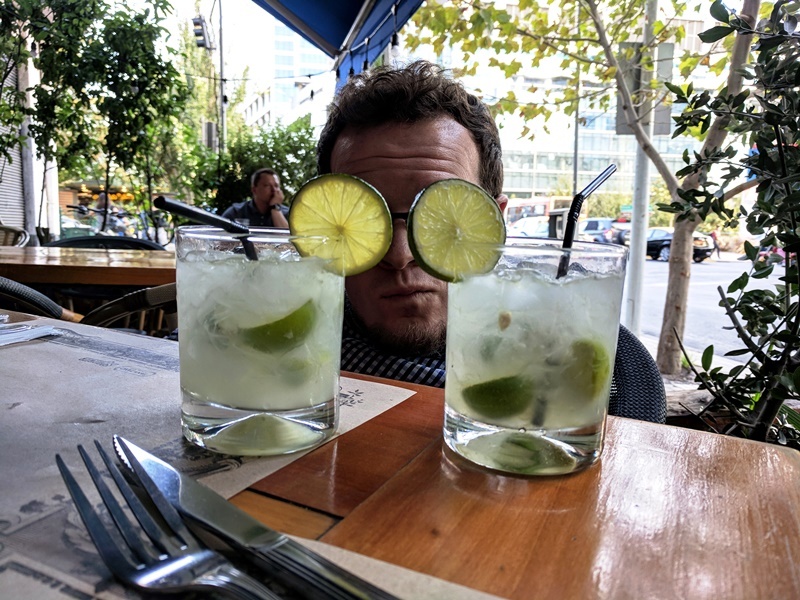 Pisco is the national drink in Chile, and while the Chileans I met mostly seem to drink it with cola (a “piscola”), I preferred the famous pisco sour – the more sour the better. The classic version comprises pisco (a grape-based spirit), fresh lemon juice, egg white and sugar syrup, although many bars will make their own variations on the theme. 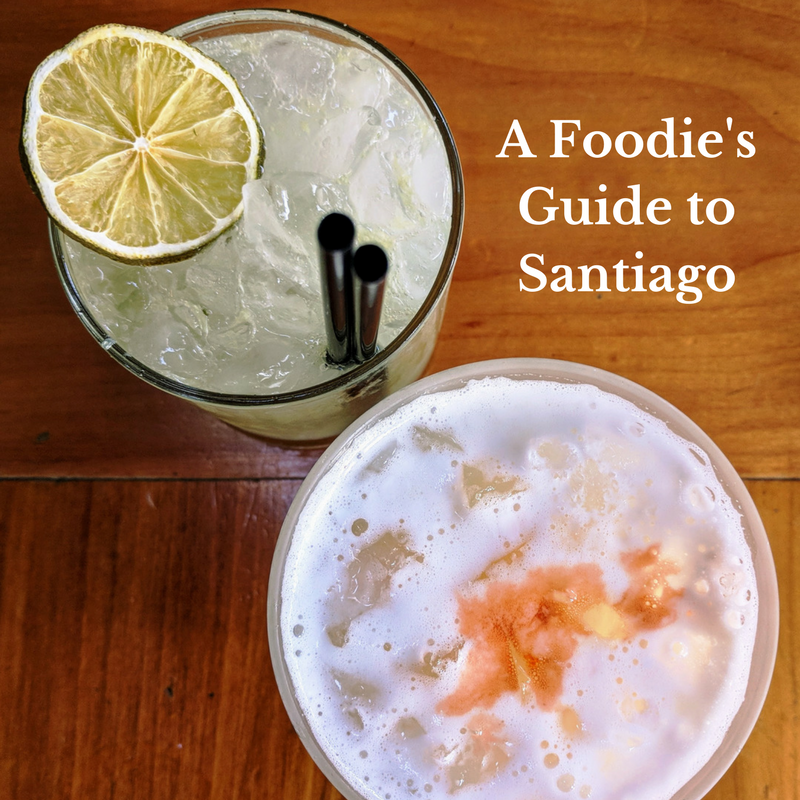 I tried a LOT of pisco sours while I was in Chile, and possibly my favourite came from the Italian bar down the road from our hotel: Signore. They also make a cracking caipirinha for those who prefer their spirits a little more Brazilian. The food was nothing to write home about, but the cocktails are a must – and as Signore is open earlier than many other bars and restaurants in the city, it’s a convenient option for us jetlagged Europeans looking to start drinking while we’re still awake. I’d like to extend special thanks to Nicholas Gill at New Worlder, without whose Santiago Eat List I’d have been completely lost. In fact, I almost didn’t write this post at all because his article is so incredibly well-researched and comprehensive. But, well, I don’t just write to be useful – I write because I want to write. 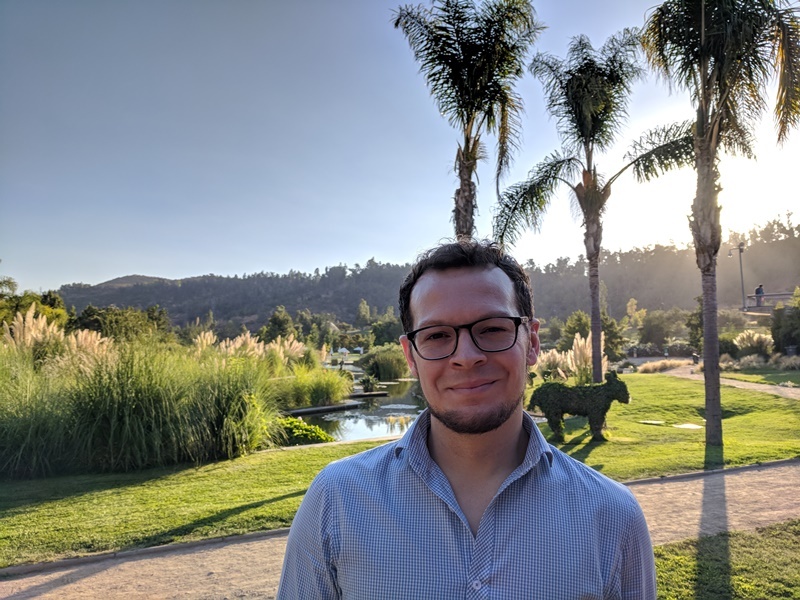 And Chile made me want to write, so here we are.